Disclosure: We received free product to facilitate our honest review. No monetary compensation was received. 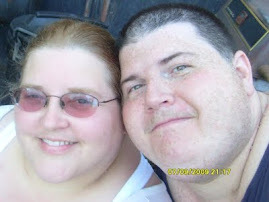 All opinions stated are those of the Shelly's Bits and Pieces family. A few years ago, my family had the opportunity to try Nonni's Biscotti. We fell in love with it immediately. The taste is wonderful and the selection is awesome! We became a Nonni's family after that trial. We keep Nonni's in our house! In July of last year, we were offered the chance to review Nonni's new THINaddictives. They were delicious too! 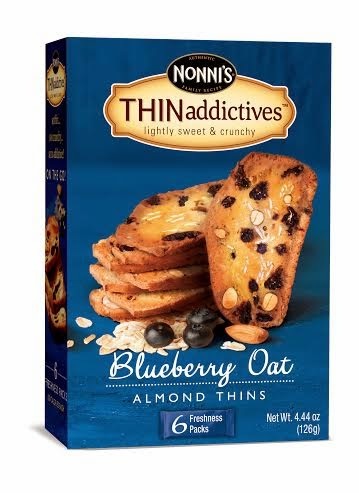 Fast forward to 2014, and Nonni's has added some new flavors to their THINaddictives line. We received a box of Banana Dark Chocolate and Blueberry Oat Nonni's THINaddictives to try out and all I can say is YUM. I am a big banana lover, but not so much a dark chocolate eater, so I was worried at first. I should have known better, because they are light, crunchy, and delicious. I actually had to hide the last couple packs from my family so I could get to eat them. Kat and Chefy devoured the box of Blueberry Oat without even offering me a bite. I will have to buy more at the store to even taste them, but according to Kat, they are, "Da Bomb." They are the ideal guilt free snack! Find and follow THINaddictives on Facebook,Twitter, Pinterest, Instagram for healthy living tips and for chances to win!! Want to try these for yourself? 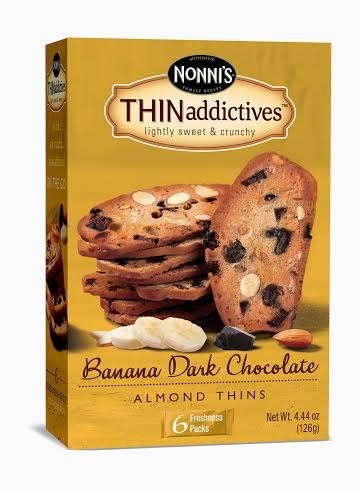 Two lucky Shelly's Bits and Pieces readers will win 2 boxes of the new flavors of Nonni's THINaddictives! 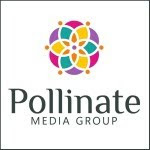 Simply enter on the rafflecopter form below and you could win! I wan to try the Blueberry Oat the most! I would love to try the new Blueberry Oat! I too think the Blueberry oat would be great to try. I think the banana dark chocolate one sounds good. I think the blueberry oat sounds best. right now I love the pistachio. I would love to try the Blueberry Oat Almond Thins ...anything Blueberry and I'm there!! The Banana dark chocolate is the one I am most interested in, but the blueberry sounds yummy too. I would be very interested in trying the Banana Dark Chocolate. I'm most interested in trying the blueberry oat. I want to try the blueberry oat Sounds yummy! I want to try the dark chocolate almond! I'm most interested in trying the double chocolate salted caramel flavor. I am most interested in trying the banana dark chocolate. I would like to try the Blueberry Oat it looks Yummy!!! I'd like to try each of them, but the blueberry oatmeal is my first choice. I would like to try the Blueberry Oat Almond Thins. I've had Nonni's regular biscotti and love them,. I bet these are just as good if not better!! Can't wait to try them! The chocolate for me! I've tried the cranberry ones in the past and they are delicious. Would love to win the blueberry flavour! Banana Dark Chocolate sounds amazing! jewelry, lifestyle and much more deals for mens and womens, join this deal fast and get 90% Discount.